BITSAT 2019: The BITSAT is in the list of popular Engineering Entrance Exams attempted by the aspirants of the engineering field. The BITSAT stands for the BITS Admission Test. The Birla Institute of Technology and Science i.e. BITS offers a variety of courses, however, the institute is renowned for its Engineering and Post-graduate science courses. Latest Update: BITSAT 2019 Notification and Application Form is expected to be released soon. 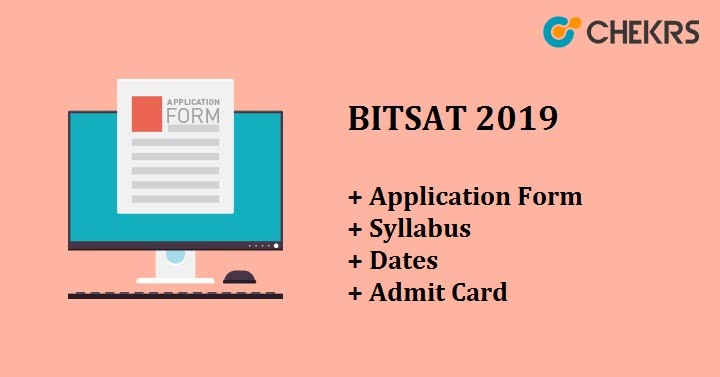 The BITSAT Exam is compulsory to be attempted for students willing to get their admissions in Pilani, Goa, and Hyderabad. Here in the article, every student can relieve their queries for different subjects like eligibility, how one can fill the application form, BITSAT Important Dates, slot booking and post-exam information like cut off marks and results. B.E degree is available here in Chemical, Civil, Computer Science, Electrical and Electronics, Electronics Instrumentation, Mechanical and Manufacturing. For pursuing Bachelors in Pharmacy also, BITSAT is the way. BITSAT Test also offers admissions in B.Pharma and Masters of Science Courses in Biological Sciences, Chemistry, Economics, Mathematics, Physics and General Studies. Admissions in the university are also open to the board toppers with relevant subjects irrespective of their performance in BITSAT. We know how important it is for all to know the event of exams they have been aspiring for. Here in the table below we have mentioned all BITSAT 2019 Important Dates. Being the top-rated university, it is obvious that a lot of students apply for getting their admissions done. Well, to make sure that each applicant has the fair knowledge of applying, read out the BITSAT Eligibility Criteria. Qualification: The students should have passed their 12th class examination with 10+2 system from a recognized board. Marks: The student should have passed with an aggregate of 75% marks with the subject Physics, Chemistry and Mathematics/Biology. Also, for the individual subject the minimum marks are 60%. Passing year: The applications will be accepted for only those who are appearing in board examination for the same year or passed it a year before i.e. 2019 and 2018 pass outs can apply. To appear in the exam, it is more important for all willing students to follow the dates and submit their application forms timely. For all, here we bring a few of them.The BITSAT Application Form Date will begin in January and last till mid march. For the computer-based test, BITSAT Application Form also needs to be filled online before the due date. The submission involves a process which is been listed here with easy to follow steps. Proceed further after entering the correct information, as asked to fill. Once the form is submitted, click on the option of fee payment through online mode. The students appearing in the exam will have to go through MCQ based question-answer pattern to be attempted online. Here we are giving you the idea of how the pattern would go on. Subjects: Physics, Chemistry & Mathematics/ Biology and English Proficiency and Logical Reasoning. Marking Scheme: 3 marks for each correct answer and negative marking of 01 marks in every wrong answer. The syllabus is the most important BITSAT Preparation Guide for all aspirants. Though there is nothing out of context is asked, however, syllabus helps every student to review the important topics such what extra topics have been added. The BITSAT Syllabus Pdf provided will also help students to learn changes for the exam. The syllabus is one of the most reliable and easily available resources to equip complete course of the exam. Here in the BITSAT 2019 Syllabus we have detailed topics subject wise for easy and effective understanding. Here a few of the best books recommendation can also be found in the detailed article. For each and every student who participates in the competition also intends their selection for sure. Here, we are sharing few tips in How to Prepare for BITSAT. Make a timetable and better to follow it until the main date. Prepare from BITSAT Best Books rather than reading out different refreshers. You can take self-analyzing sessions by preferring to previous papers. Don’t skip BITSAT 2019 Free Mock Test available here for brushing up your skills. As the exam will be organized online, students will have to make sure that they are cautious for their slot bookings. Though online, the test will be conducted on different dates across different regions. Through keeping eyes on BITSAT Slot Booking Date, participants of the exam can learn which the main date for them is. Contenders will be able to know their exam date here and instructions for the exam. The BITSAT Hall Ticket is important for all those students who will be participating in the online test. In order to get entry at the exam hall, admit card will be the only proof they can have. Once participants are done with their slot bookings only then those who have done it will be able to download admit cards. The BITSAT Admit Card will be available on the website one week earlier of the exam date. It can be downloaded more easily through the navigation provided on the websites. As the BITSAT is one of the university level competition test, the cut off marks will decide who are the rank holders. The cut off marks for BITS is not classified into caste category rather it is different for each course. The BITSAT Cut Off provided by us will help all participants know the benchmarks set for the year. For every participant of BITSAT, it is easy to know their result and performance post to completion of the test. Once the BITSAT online test is finished, the participant can check on the screen how many questions attempted by him/her were wrong and correct. However, it does not indication qualifying criteria. The marks scored by the individual can also be checked on the website next day. However, the BITSAT Result 2019 Date will determine who has made up to the level. All of the updates regarding result can be check at first by taking BITSAT Rank List here.